Manufactured in France from 1947 until 1947. The versions numbering is as used in "La photo toute simple" published by the Nièpce Lumière Club. Early versions of Ultra-Fex have no shaft on the supply reel, and therefore, there is a flat camera body surface on user right-hand. The decorative plate in the front is adorned with a round graphic surrounding the lens and the name Ultra-Fex following the curve of the circle. Around the lens is black, bakelite, no metal trim. The plate is held in place by two screws the slotted head of which can be seen. 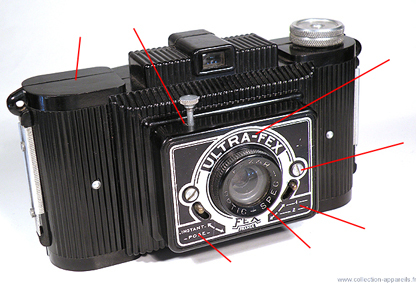 The speeds selector lever is marked "Instant - Pose" and those of the apertures is marked "1-2". The trigger does not have a hook protecting against untimely triggering.